Create your own little art quilt using simple geometric shapes complimented by creative stitching. In the first session, you will use 3 fabrics to create a unique artistic expression, following my step by step method. 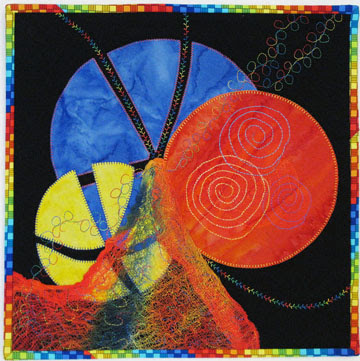 In the second session, which is optional, you will add thread play and quilting to make your piece sizzle. Session I: Saturday, March 17th from 10-12. No sewing machine required. $20. Session II: Saturday, March 24th from 10-12. Bring your sewing machine. $20. Optional kit available for $20, which includes everything you need for both sessions. Pre-paid registration required. Contact Dij Pacarro at quilterdij@earthlink.net or 321-806-5550.